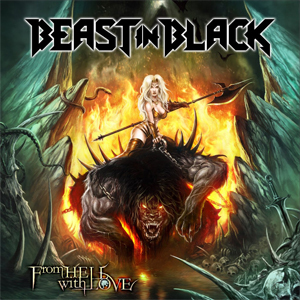 BEAST IN BLACK Unveil From Hell With Love"
Up and coming metallers BEAST IN BLACK recently announced the release of their sophomore record titled From Hell With Love, for February 8, 2019 through Nuclear Blast. Just a few days before the group with former BATTLE BEAST guitarist Anton Kabanen embarks on an extensive European tour as special guest to Finnish symphonic metal giants NIGHTWISH (all dates can be found below), they are happy to unveil the cover artwork of their forthcoming album, which was once again created by Roman Ismailov. In addition, more dates have been added to the band's From Hell With Love Tour 2019.